What is SSL/TLS and HTTPS? SSL is an acronym for Secure Sockets Layer. A type of digital security that allows encrypted communication between a website and a web browser. The technology is currently deprecated and has been replaced entirely by TLS. TLS stands for Transport Layer Security and it ensures data privacy the same way that SSL does. Since SSL is actually no longer used, this is the correct term that people should start using. HTTPS is a secure extension of HTTP. Websites that install and configure an SSL/TLS certificate can use the HTTPS protocol to establish a secure connection with the server. The goal of SSL/TLS is to make it safe and secure to transmit sensitive information including personal data, payment or login information. It’s an alternative to plain text data transfer in which your connection to a server is unencrypted, and it makes it harder for crooks and hackers to snoop on the connection and steal your data. Most people are familiar with SSL/TLS certificates, which are used by webmasters to secure their websites and to provide a secure way for people to carry out transactions. You can tell when a website is using one because you’ll see a little padlock icon next to the URL in the address bar. How Do SSL/TLS Certificates Work? When and Why is SSL/TLS is a MUST? Does SSL/TLS Make an Impact on SEO? How SSL/TLS Relates to HTTPS? How to Add SSL/TLS to Your Website? How to Add SSL/TLS to a WordPress Website? SSL/TLS certificates work by digitally tying a cryptographic key to a company’s identifying information. This allows them to encrypt data transfers in such a way that they can’t be unscrambled by third parties. SSL/TLS works by having both a private and a public key, as well as session keys for every unique secure session. When a visitor enters an SSL-secured address into their web browser or navigates through to a secure page, the browser and the web server make a connection. During the initial connection, the public and private keys will be used to create a session key, which will then be used to encrypt and decrypt the data that’s being transferred. This session key will remain valid for a limited time and only be used for that particular session. You can tell whether a website is using SSL by looking for a padlock icon or a green bar at the top of your browser. You should be able to click on this icon to view the information on who holds the certificate and to manage your SSL settings. SSL/TLS is a must whenever sensitive information such as usernames and passwords or payment processing information is being transferred. The goal of SSL/TLS is to make sure that only one person — the person or organization that the uploader intends — can access the data that’s being transferred. This is particularly important when you think of how many devices and servers the information is transferred between before it reaches its destination. When you need authentication: Any server can pretend to be your server, hijacking the information that people transmit along the way. SSL/TLS allows you to prove the identity of your server so that people know that you are who you say you are. To instill trust: If you’re running an e-commerce site or asking users for the kind of data that’s important to them, you need to engender a sense of trust. Using an SSL/TLS certificate is a visible way of showing visitors that they can trust you and it’s much more effective than anything you could say about yourself. When you need to comply with industry standards: In some industries such as the finance industry, you’ll be required to maintain certain base levels of security. There are also Payment Card Industry (PCI) guidelines that you need to adhere to if you want to accept credit card information on your website. And one of those requirements is the use of an SSL/TLS certificate. Remember that SSL can be used across almost any device, which also makes it a versatile security choice in today’s multi-device age. The advantages of using SSL certificates outweigh the time and monetary investment it requires to set them up, so what have you got to lose? The short answer is: yes it does. Google made changes to its algorithm as far back as 2014 to prioritize websites that used an SSL certificate, and they’ve continued to place emphasis on SSL certificates ever since. They’ve officially stated that sites with SSL statistics will outrank those without if all other factors are equal, and while secure sites make up only 1% of results, 40% of searches return at least one SSL-secured site on the first page. In practical terms, SSL makes a small difference when it comes to SEO and simply installing an SSL certificate to your site will make much less of a difference than creating regular fresh content and building a strong inbound link profile. That doesn’t mean that you should forget all about them, though. It’s also important to remember that search engines use a whole variety of different metrics to determine where websites rank. One of those metrics is how often people bounce back from your site to the results page, and having an SSL certificate could make the difference between someone buying from you or clicking away. Lots of other metrics that are used to rank sites can be affected when you choose whether or not to use an SSL certificate. Setting up an SSL certificate will have an effect on your website’s search engine performance, but that’s not why you should use one. Instead, set up an SSL certificate to engender trust amongst your visitors and take the SEO boost as a bonus. When you set up an SSL certificate, you configure it to transmit data using HTTPS. The two technologies go hand in hand and you can’t use one without the other. URLs are preceded with either HTTP (Hypertext Transfer Protocol) or HTTPS (Hypertext Transfer Protocol Secure). This is effectively what determines how any data that you send and receive is transmitted. SSL/TLS doesn’t have to cost an arm and a leg. Find affordable SSL offers with Hostinger! This means that another way to identify whether a site uses an SSL certificate is to look at the URL and to see whether it contains HTTP or HTTPS. That’s because HTTPS connections require an SSL certificate to work. Most of the major browsers including Google Chrome, Firefox and Microsoft’s Edge will prominently display when users are accessing a site through a secure connection. In Chrome, for example, you’ll see a green padlock icon in the address bar alongside a message saying “secure”. Users can view more details about the SSL certificate by clicking on it. Furthermore, since the introduction of Chrome 68 in July 2018, websites without an SSL/TLS certificate display a “not secure” warning. 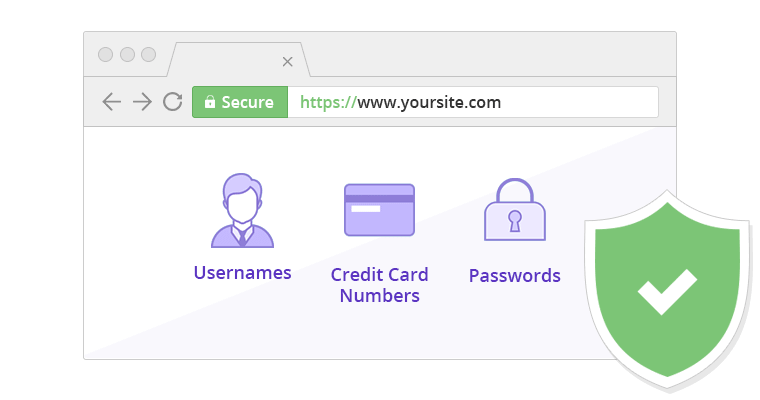 Because browsers are going out of their way to actively display whether sites are secure, it’s in your best interests as a website owner to take the hint and to secure your site. That way, visitors can instantly see that your site is reliable as soon as they visit it. Adding an SSL/TLS certificate to your website can get confusing and should only be attempted by a web professional. You’ll know whether you fit the bill or not. The first step is to enable SSH access before installing ACME client. At this point, you can generate your SSL/TLS certificate and install it via your web host’s admin area. We’ve written a full tutorial on how to do this that should help out if you’re ready to get started. 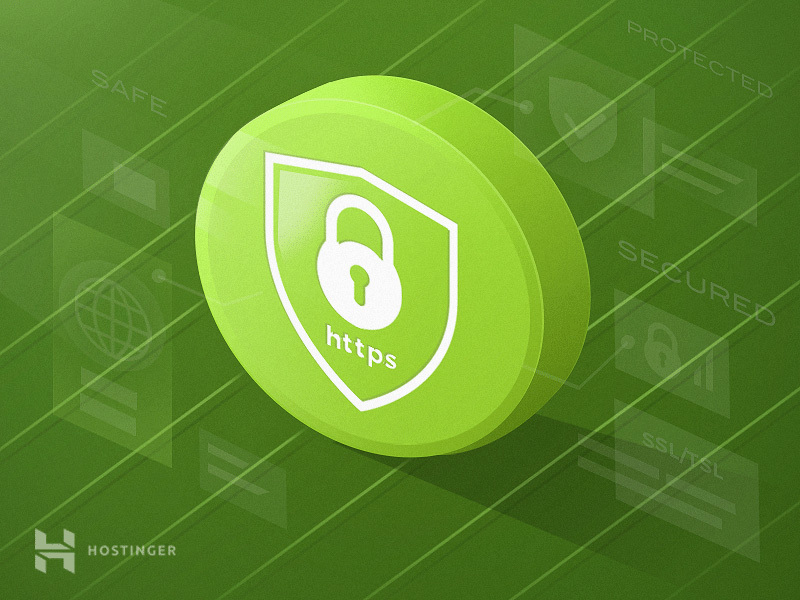 If you’re looking for a paid SSL/TLS certificate provider then look no further than Hostinger. We offer a lifetime of SSL/TLS security for just for just a one-time fee. Alternatively, a free certificate is bundled with our annual Business hosting plan. Once your certificate is ready, you can force HTTPS by pasting a code snippet to your .htaccess file. It’s a little easier to get started with SSL/TLS on WordPress. It offers plugins like Really Simple SSL and SSL Insecure Content Fixer that handle the technical part for you. However, you’ll still need to purchase an SSL certificate from a provider. Once your SSL certificate has been purchased and installed, you’ll still need to change the settings in your WordPress dashboard (or use one of the above-mentioned plugins). The good news is that all you need to do is to log into WordPress and navigate to Settings › General. Scroll down to the WordPress Address (URL) and Site Address (URL) fields and change them from HTTP to HTTPS. Be sure to save the changes and to check your site to make sure that it all works as intended. SSL stands for Secure Sockets Layer (while TLS stand for Transport Layer Security) and shows visitors that they can safely transmit sensitive information to and from the server. It encrypts all of the data transfers in such a way that they can’t be unscrambled by third-parties such as hackers and scammers. You can tell whether a website is using SSL/TLS by looking for a padlock icon or a green bar at the top of your browser. You can normally click on the icon in your browser to view who the certificate belongs to. SSL/TLS has an impact on security, search engine optimization and can make the difference between your site outranking or losing to a competitor. With that said, it’s not some all-powerful SEO tool and as such, SSL/TLS certificates should be used because they’re best practice and not because you think they’ll help you to rank higher on search engines. And of course, if you need help getting started with SSL certificates or if you want to take advantage of a lifetime of SSL security, get in touch. We’ll be more than happy to help!